Many years ago, I (Martin) was bowled by Sarfraz Nawaz, the Pakistan fast bowler. This is my greatest claim to fame as a cricketer. Our opposition—a team of modest talents if not attitude—paraded the genial Sarfraz before us with (I thought) an unseemly enthusiasm that spoke volumes about their desperation. Since these were the days before anyone wore helmets, I was thankful that Sarfraz, who by then was in his early forties, was bowling at perhaps half his former speed. Unfortunately, the reduction in pace somehow made the ball hoop around even more. I saw the ball leave his hand, waved my bat in its general direction as the ball made its way toward me, and then heard the rattle of the stumps. I had failed to trouble the scorers. As I walked back to the pavilion, an opposition player noted that I’d been moving backwards, away from the stumps, as the ball was delivered. I don’t remember that, but it doesn’t surprise me. I wasn’t playing Sarfraz the middle-aged ringer, I was playing the scourge of world batsmen in the 1970s and early 1980s. In short, Sarfraz had gotten into my head and psyched me out. 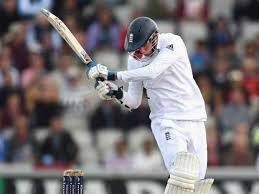 Last August, Stuart Broad was hit in the face by a bouncer from Varon Aaron, as he was trying to hook the ball. Broad was wearing a helmet, but the ball burst through the grille and struck him on the bridge of the nose. After the blood, bruising, and stitches, Broad shrugged it off and claimed he was fine. But it can’t have done his confidence any good when Australian Phil Hughes was killed by a ball to the head earlier this year, playing the same shot. Ever since, Broad, who used to be a punishing lower-order batsman, has been a shadow of his former self at the crease. As I did against Sarfraz, Broad is backing away as the bowler delivers the ball. Like me, he is playing the memory of pace and not necessarily the reality—even though Broad is often facing genuinely fast bowlers who will bowl bouncers in his direction, ones that can hurt him. Nowhere was this fear more in evidence than in his embarrassing dismissal against New Zealand in last Thursday’s World Cup match. Baseball and cricket are as much games of psychology as they are of hand–eye coordination. The pitcher/bowler has the advantage over the batter/batsman in that the latter has only a split second to recognize the nature of the delivery and react accordingly. Broad may be telling his mind to stay focused and not move; his mind, however, is remembering what it felt like to have a ball smash into your face at over eighty miles an hour and his body is quite naturally involuntarily moving out of the way. There is no easy solution to this. Broad is a fine bowler, and he’s needed in the England team. However, he needs to bat at number eleven until—somehow—he regains his confidence. Until then, however, he is—as I was with Sarfraz—a walking wicket. This entry was posted in Australia, Baseball, Cricket, England, New Zealand and tagged Phil Hughes, Sarfraz Nawaz, Stuart Broad, Varon Aaron, World Cup. Bookmark the permalink.